There is a major difference between member-driven political action based on sound UE principles, and “playing politics” with lawmakers and candidates. With critical national and state elections coming up on November 6 – and some important primary elections before that – every UE steward and leader must take some time to become familiar with our union program, as well as the nuts and bolts of the electoral system. While for some people political discussions can be controversial and stressful, as unionists we have to participate in the political process to protect what we have worked so hard to negotiate at the bargaining table. These days, union political action is a necessity, not a choice. Our union decides – with full rank-and-file input and with discussion and voting at our convention – what positions we will take on political issues and what we will do about them. The 75th UE National Convention in August 2017 debated and adopted 33 resolutions dealing with a range of political issues that impact working people and our union. These resolutions are compiled in the booklet, “UE Policy 2017- 2019”, which has already been distributed to every UE Local. If you haven't seen it, ask your local officers for this booklet. You can also find UE’s policy on UE’s website at ueunion.org/ue-policy. Take some time to read the current UE Policy, and pay special attention to the Report of the Policy Action Committee, which included the main "action items" set as the union's priorities by convention delegates. The Policy Action Report guides our union to focus on the most critical political action tasks that confront us. In the aftermath of the 2016 elections, working people, including UE members, have been organizing and fighting back against these attacks. Elements of Bernie Sanders’ presidential campaign have organized Our Revolution to continue the fight for the issues that Bernie campaigned on and to support candidates who run these issues. UE and the other unions that supported Bernie’s campaign have formed Labor for Our Revolution (LfOR) to build a pro-working-class political movement. All three UE regions and the GEB have voted to affiliate with LfOR. UE members have also been active in electoral work since the 2016 elections. UE Local 150 members in North Carolina were active in city council races in Greensboro and Durham, which resulted in pro-union city council candidates getting elected. The pro-union majority elected to Durham City Council then went on to pass a resolution calling on the state to revoke the ban on collective bargaining for public workers. UE Local 170 members in West Virginia organized a forum to interview candidates running for the state legislature in 2018, where nearly three dozen candidates attended. The UE Eastern Region endorsed two members of the Democratic Socialists of America (DSA) running for the Pennsylvania Legislature in the Pittsburgh-area, who went on to win their primary races against two entrenched, establishment Democratic state representatives. The 2018 mid-term elections are going to determine which party controls the U.S. Congress, 50 state legislatures and the governors of 36 states, including California, Connecticut, Iowa, Illinois, Massachusetts, Maryland, New Hampshire, Ohio, Pennsylvania, Vermont and Wisconsin. UE treats rank-and-file political action as a year-round necessity – not just an election-year indulgence – and we recognize the critical importance of getting members to vote – even when we're not all that pleased with the choices on the ballot. However, getting our members to vote is only one aspect of UE’s political action program. Members of UE Locals 203 and 255 joined Vermonters from around the state to tell their legislature to raise the state’s minimum wage to $15 an hour. UE members in North Carolina and West Virginia supported teacher strikes in their states, which were part of the red state teacher rebellion earlier this year. UE Local 150 members in North Carolina also successfully fought to raise the minimum wage for state workers to $15 an hour. UE Local 170 members in West Virginia defeated their Republican governor’s attempts to sell off the state’s hospitals and nursing homes. UE members in Iowa continue to fight back against their state’s draconian legislation that gutted public employees’ union rights. UE Local 893 won six recertification elections and UE Local 896/COGS, which represents graduate employees at the University of Iowa, has found ways to continue to represent its members even without dues deduction and collective bargaining. 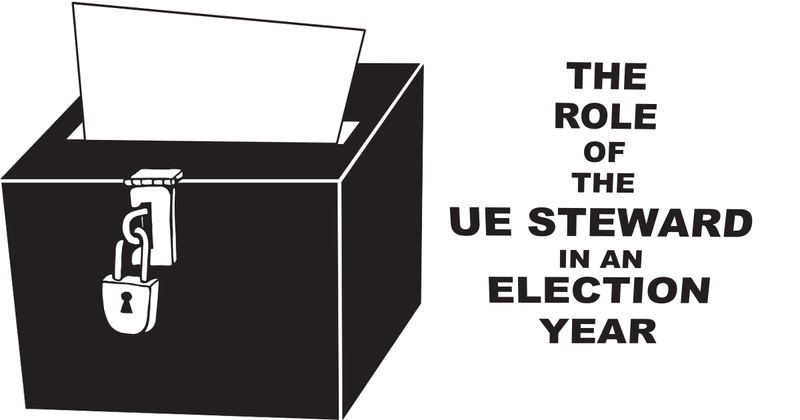 UE's approach to elections is different from that of many other unions. Unlike most unions, whose candidate endorsements are chosen by their top leadership, UE’s rank-and-file members decide which candidates to endorse, if any. We look at where the candidates stand on the issues of greatest concern to workers, and we share that information with members so they can make a sensible decision for themselves. We look at their stated positions on the issues, their voting records, and their backgrounds. UE does not give money to candidates, from either party. The national union has no political action fund for making campaign donations. (A few UE locals have small political action funds, raised from member donations, and make contributions to endorsed candidates.) UE focuses our energy on voter registration, education, voter turnout – and in mobilizing members on the issues we're concerned about. We do that before, during and after elections. Some unions support Democrats, almost automatically, and give them money regardless of the individual politician's record. UE is independent of both major parties, and candidates need to earn our support. Visit the website eac.gov, sponsored by the United States Election Assistance Commission. Here you will find everything you need to know about registering your co-workers, family and friends to vote. Each state has different rules and forms, so find your state and download the voter registration form. Read how voter registration works in your state, and make sure you know what the deadlines are. Find out who in your department or workplace is registered to vote, and who is not. Develop a plan to approach those who aren't registered, have a conversation with each of them about why it's important for them get registered to vote and let them know you have the form to sign them up. Be aware that you have the right to conduct voter registration at the workplace, particularly in break areas, lunch rooms, and other non-work areas. Have people return the completed forms to you, so you can make sure they get mailed or delivered to the proper state or county election offices in time.